Day 9 of the 30 for 30 Challenge! I'm loving the black and blue combination of this outfit. Some people don't like mixing these two colors but I think they can be friends. Hey remixers, we are almost a third of the way through! Hope you haven't run out of outfit ideas already! If you haven't check In Kinsey's Closet out on Facebook, you can do so here! Oops, how did these get here?? Okay, the title reminded me of my little guys so I thought I'd share. I love when I see fellow bloggers feature their pets so I put up my two loves for you all! Also, check out But wait, there's more! She recently needed some help putting together a look with her 30 items for an event that was a little fancier than she had anticipated when making her selections. I'm sure we all will be in this position (or already have been!) at some point during our 30 days. Has something unexpected come up for you that had you scrambling to find something that worked with your 30 items? OMG your cats are adorable! I love the last picture especially. And I'm loving the blue & black combo. Super cute. Adorable outfit and i'm in love with Uli heehee.... such a cute cat! I'm wearing black and blue today too! I love the combo. Oh I want to scratch that kitties belly! Super love black and blue together! Your cats are adorable. And I agree-black and blue go great together. I love unexpected color combinations. Hi, I'm a new blog follower. Also, I'm in love with your shoes, and your outfit, but mostly your shoes! Kittiiiies!!! You look incredible! But what else is new? 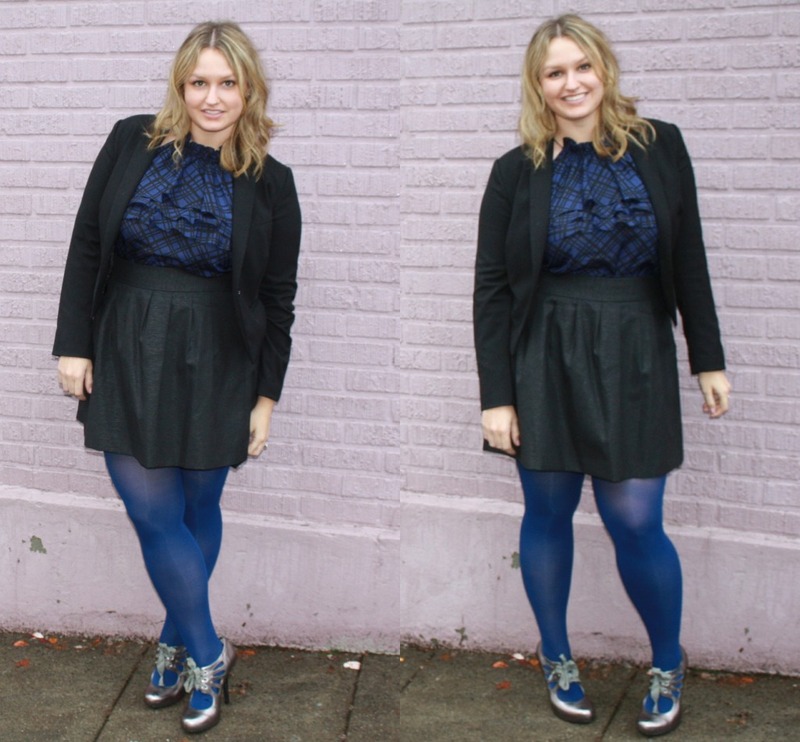 I love the black and blue, but the tights/shoes combo is my favorite! Oh my, I thin I have the same top as you from BR but I've never worn it quite like that. Hmmn.. you are giving me quite an inspiration! You look so pretty today!Nice poses! PS: Your kitty cat = ADORABLE! I am guilty of posting pictures of my pet, so I whole heartedly approve of your kitty pictures. I also approve of black and blue, especially with those killer shoes. i love that top! found your blog via the 30x30 remix list. love your remixes! I like the black and blue combo, I think they can definitely be worn together. Your cats are super cute! Yes, you're right. You can ix two colors & make it work. You showed us exactly how to here. So lovely.